Overall, at 3.5 out of 5 stars, Dr. David Williams Probio Serene is an above average product. I really commend Dr. David Williams for having such a unique, convenient probiotic. I was really excited to test this product out because it’s something I’ve never tried before. The probiotics come in “sachets” or little plastic packets. They remind me of the flavor packets you can use to enhance your water. The crazy thing about this product is that the powder in the sachets doesn’t need to be mixed in water! You do this once a day, with or without a meal. At first I thought the powder was gross and kind of chalky, but after a few times I got used to it. I can’t get over the convenience of this product. You don’t ever have to refrigerate these sachets, making them perfect for on the go. I also commend this product for having an awesome money back guarantee, 90 full days. So even with all the excitement over this product, there are a few drawbacks that I need to mention. This probiotic is NOT allergy friendly. It contains MILK and SOY. Probio Serene is also very expensive, coming in just under $40 for only a 1-month supply. Overall, I think Probio Serene is an above average product that is very unique and completely convenient for daily use and travel, if you can get passed the higher price tag and the fact that it contains milk and soy. Dr. David Williams Probio Serene has 3 billion cells per sachet and they come in 2 different probiotic strains. This particular strain has been researched to show a potential stimulation of immune and digestive functions. This means that it could potentially help with the symptoms that come along with lactose intolerance and help lessen the prevalence of diarrhea. Lactobacillus helveticus may also help balance out the bacteria levels in the body and keeping the bad bacteria in check. This strain has also been shown to potentially help calcium absorption and lower blood pressure. The second strain used is Bifidobacterium longum. Bifidobacterium longum has been shown to help with inflammation associated with inflammatory bowel conditions such as Irritable Bowel Syndrome (IBS). This strain may also help prevent high cholesterol levels and reduce the prevalence of certain allergies. Bifidobacterium longum has also been shown to potentially help recolonize the bacteria in the body after it has been altered from taking antibiotics. This probiotic is not allergy friendly. Probio Serene contains MILK and SOY. Double whammy with the milk and soy, it’s so unfortunate. This product is gluten free though, so there’s a little perk. The other ingredients include: Xylitol, maltodextrin, plum flavor, malic acid. 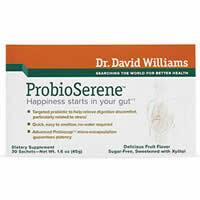 For 30 sachets, Dr. David Williams Probio Serene costs $39.99. This ends up being a daily cost of $1.33. This is definitely more expensive in the world of probiotics. I do think it’s a good value for this unique product, which will last you a month. It just would’ve been nice to see the price a little cheaper. I didn’t see any negative side effects while taking Probio Serene. I like when I can take a new probiotic supplement and not have any icky side effects. Dr. David Williams Probio Serene has an awesome guarantee. To buy Dr. David Williams Probio Serene, click here. Best Used As Daily probiotic to help support digestive system. Allergy Concerns Product contains MILK and SOY. Side Effects I didn’t see any negative side effects. Guarantee 90 day, 100% money back guarantee.